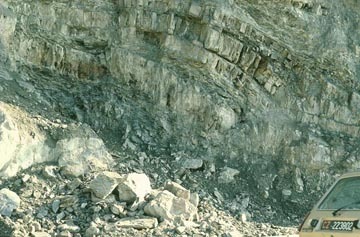 Debris flow deposit in alluvial fan at mouth of T. Bardano. Map Sheet 3 (small | large). 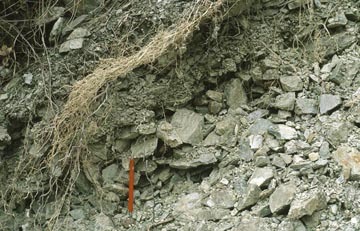 Rubble in recent debris flow deposit. Red pen for scale. 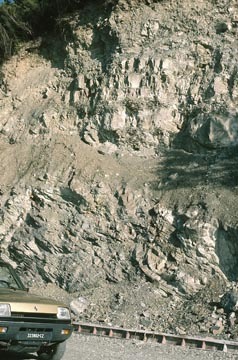 Wave cut front of debris flow-dominated alluvial fan at mouth of T. Santa Croce. 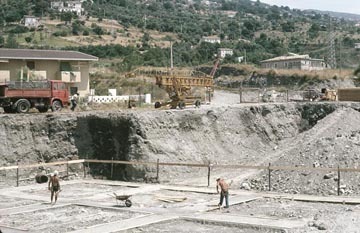 Construction excavation for Torremezzo building foundations in debris flow-dominated alluvial fan at mouth of T. Bardano. Map Sheet 3 (small | large). 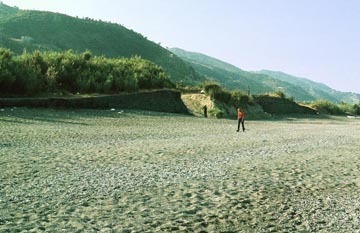 Debris-laden channel that was once bounded by stone wall levees to contain debris flows from canyon mouth to the sea across highway and railroad. Walls have been partly removed. 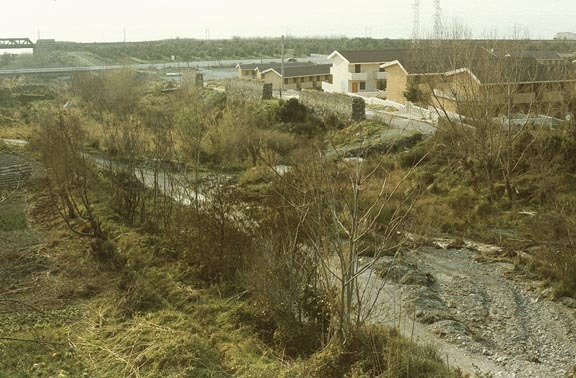 Now future overflows will more easily flood adjacent Torremezzo housing. 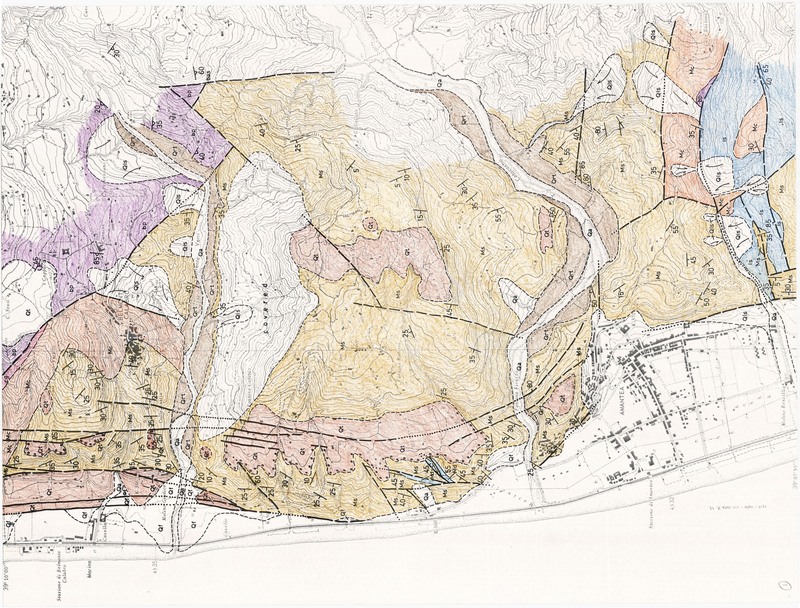 T. Bardano, Map Sheet 3 (small | large). 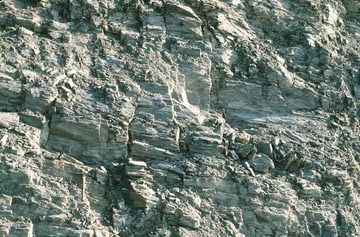 Ground view of range front fault scarp. 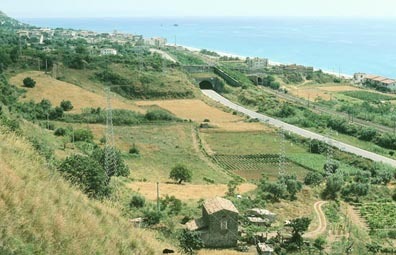 Highway and railroad tunnels beneath channel that carries T. Pepaio to the sea. 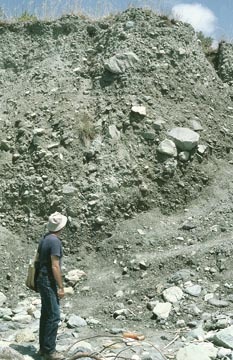 Excavated alluvial fan near T. Pepaio, Catena Costiera, Calabria. 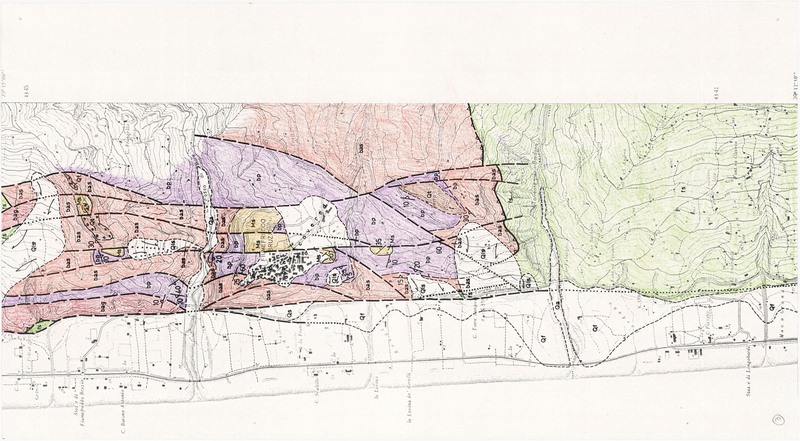 Map Sheet 2 (small | large). Ground view of range front fault scarp and excavated part of T. Pepaio alluvial fan is outlined in white Catena Costiera, Calabria. 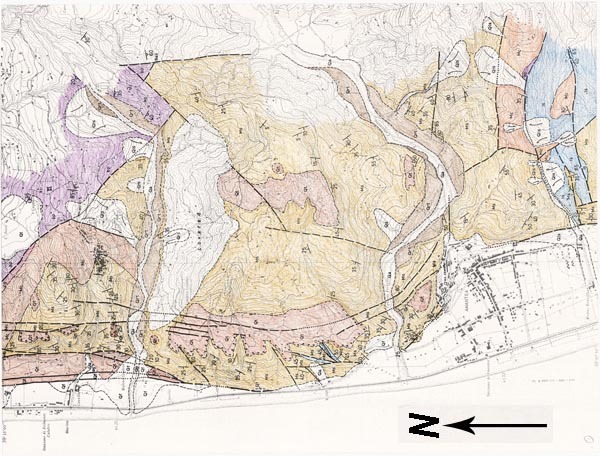 Map Sheet 2 (small | large). 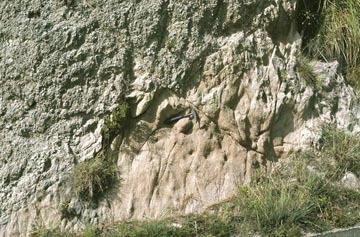 Conglomerate at base of calcarenite, Old Hwy near Torrente San Martino. 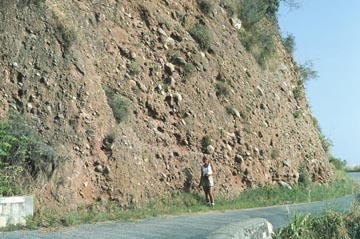 Faults north of the mouth of Catocastro, Catena Costiera. Map Sheet 1 (small | large). 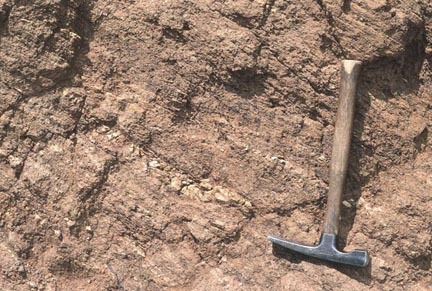 Small fault cuts contact between calcarenite and sandstone, Catena Costiera. Hammer for scale. 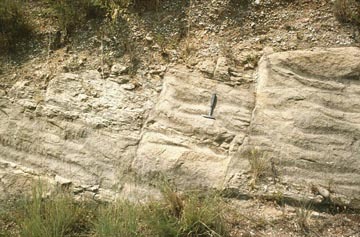 Faulted terrace overlying sandstone, Comolo, Catena Costiera. Map Sheet 1 (small | large). Hammer for scale. 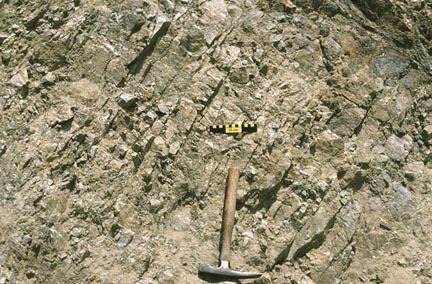 Strongly fractured Frido quartzite in fold, Catena Costiera. 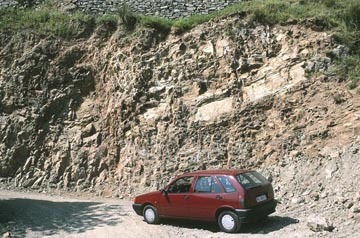 New roadcut in Bagni rocks, Fiumefreddo, Catena Costiera. 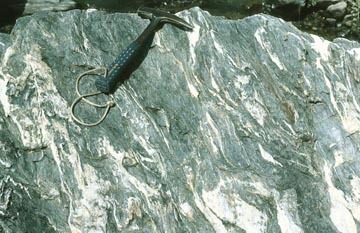 Black schist at the head of T. San Martino, Catena Costiera. 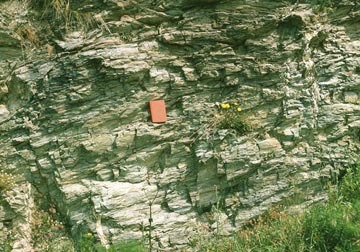 Bagni Formation phyllite, Catena Costiera. Notebook for scale. 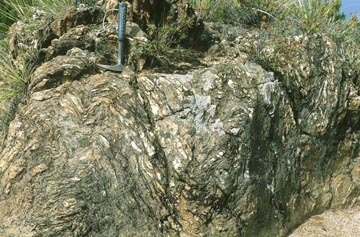 Phyllite boulder in T. Verri (Bagni Fm), Catena Costiera. 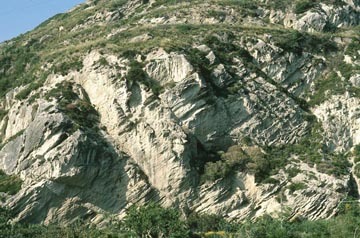 Pervasively fractured Polia Copanello unit, ridge south of T. Pisciotto, Catena Costiera, Calabria. See Zeck, 1990. Deeply weathered Polia Copanello rocks south side of Cozzo Vialonga, Catena Costiera, Calabria. See Zeck, 1990.